The American economy remains too weak. Over the past 35 years, the vast majority of workers have seen their wages stagnate. And, racial and gender wage gaps have persisted. The failure to aggressively target and achieve genuine full employment explains a large part of this disappointing performance. And this failure looks poised to continue. Despite these indicators that we are far from full employment and the fact that the inflation rate remains below the Federal Reserve’s target rate, pressure is mounting on the Federal Reserve to raise interest rates to slow the pace of economic expansion and job growth in the name of fighting hypothetical future inflation. It would be a terrible mistake for the Fed to yield to this pressure. This paper makes the case that the Fed should pursue genuine full employment that features robust wage growth, rather than be satisfied with job growth that is consistent but does not boost the pace of wage growth. 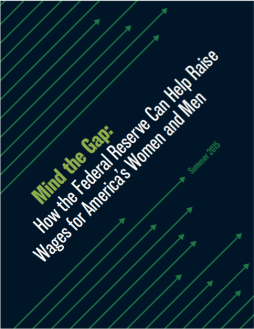 The paper considers the shifts in gender and racial wage gaps since 1979 and highlights the fact that because the vast majority of American workers have seen near-stagnant wages even as economy-wide productivity growth has consistently risen, there is ample room for wage-gaps to close without any group suffering wage declines. A significant portion of the limited progress towards closing the gender wage gap in recent decades has been due to the outright decline of men’s wages. Productivity growth—which measures the average amount of income generated in each hour of work in the economy—has remained strong. At 64.9 percent over the 35-year period, productivity growth represents the possible increases in every worker’s wage throughout the economy. White women, the group whose median wage growth has been strongest over the period, gained at roughly one-third the rate of productivity. The Federal Reserve plays a powerful role in shaping labor market trends. To be sure, these wage gaps among groups of workers result from a long history of discrimination within the labor market, education, housing, wealth-building, and criminal justice policies, and require a full array of economic, social, and political policies. However, until we reach genuine full employment, a Federal Reserve decision to slow the economy will hamper the ability of workers’ wages to rise. The Federal Reserve should set a clear and ambitious target for wage growth, which will provide an important and straightforward guidepost on the path to maximum employment.Wage targeting can be fairly easily tailored to the Fed’s price-inflation target and pegged toincreases in productivity. The Fed should maintain a patient, but watchful posture. The history of the past 35 years shows a generally steady downward trend in price inflation and that prematurely slowing the economy results in higher than desirable unemployment. The Federal Reserve should not consider an interest-rate hike until indicators of full employment—particularly wage growth—have strengthened. Raising interest rates too soon will slow an already sluggish economy, stall progress on unemployment, and perpetuate wage stagnation for the vast majority of American workers. This harm will be disproportionately felt by women and people of color, who are concentrated in the most vulnerable strata of the workforce.